Non-complicated cholelithiasis associated with GERD. Service of General Surgery and Digestive Diseases. 1Unit of Motiliy. 2Service of Digestive Diseases. Objectives: the aim of this study was to evaluate the efficacy of combined laparoscopic surgery for non-complicated cholelithiasis and gastroesophageal reflux disease (GERD) in patients with low surgical risk. Methods: a total of 680 cholecystectomies performed by means of laparoscopic surgery were retrospectively studied from February 1991 to February 2002. A total of 442 patients that fulfilled the inclusion criteria were divided into two groups: group A: non-complicated cholelithiasis (cholecystectomy alone), consisting of a total of 362 patients, and group B: non-complicated cholelithiasis and GERD (cholecystectomy and Toupet's fundoplication in all cases) in 80 patients. Demographic and clinical data, intraoperatory incidences, and post-surgical complications were prospectively collected and compared for all patients. The results of reflux surgery (group B) were evaluated at 6 months by means of 24-hour pH-metry. Results: in spite of the fact that the group undergoing combined surgery consisted of patients with greater weight and older age (p < 0.05), no significant differences were found in the number of intraoperative incidences and post-surgical complications between both groups (NS). 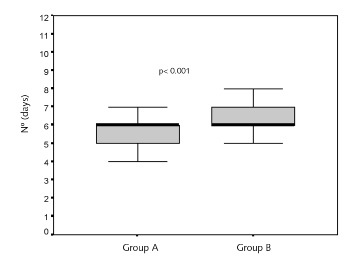 Significant differences were only found in the duration of surgery: 48 ± 25 min (10-150) in group A compared to 112 ± 23 min (80-180) in group B (p<0.001), and in the return to normal daily activities (5.8 ± 0.9 days vs 6.5 ± 1 days in group B) (p< 0.001). In the latter group a normalization of 24-hour pH-metry values and an absence of symptoms associated with reflux were observed in all cases. Conclusions: in patients younger than 75 years with low surgical risk and non-complicated cholelithiasis and GERD, both illnesses can be resolved during the same surgical procedure by laparoscopy with no increased risk or postoperative complications. Key words: Laparoscopic cholecystectomy. Gastroesophageal reflux. Toupet's fundoplication. Endoscopic surgery. Pozo F, Giganto F, Rodrigo L. Non-complicated cholelithiasis associated with GERD. Results of combined laparoscopic surgery in low risk patients. Rev Esp Enferm Dig 2004; 96: 237-245. Correspondencia: Luis Rodrigo. Servicio de Aparato Digestivo. Hospital Central de Asturias. C/ Celestino Villamil, s/n. 33006 Oviedo. Telf. : 985 10 80 58. Fax: 985 27 36 14. In the last decade endoscopic surgery has been established as the treatment of choice for symptomatic biliary cholelithiasis both in its simple and complicated forms (1-5). Different demographic characteristics exist in patients (age, classification according to the American Society of Anesthesiology -ASA-, and form of presentation) that may influence the decision of an endoscopic approach or even its conversion to open surgery once indicated (6-8). On the other hand, we know that a subgroup of patients with cholelithiasis presents associated illnesses in the upper gastrointestinal tract, such as gastro-esophageal reflux disease (GERD) (9). Furthermore, evidence exists showing that surgery for cholelithiasis alone, either open surgery or laparoscopic, may cause or impair GERD (10), and that symptoms of reflux are more common after laparoscopic cholecystectomy than in the rest of the population (11). Part of the clinical failure that patients suffer when undergoing cholecystectomy may be due to the presence of associated gastroesophageal reflux (11,12); thus, if this is resolved, the frequency of “post-cholecystectomy syndrome” can be considerably reduced (11-13). It therefore seems reasonable to systematically look for the presence of GERD prior to surgery for cholelithiasis, and to try to resolve both illnesses during the same surgical procedure. In this way later surgery may be avoided. Prior to the development of laparoscopic surgery, our group always performed combined surgery in the same procedure whenever possible, if we knew of the presence of both illnesses. However, in laparoscopic surgery, we do not currently possess clear evidence that combined surgery is absolutely necessary. Therefore, the aim of this study was to evaluate surgery duration, conversion rates of endoscopic to open surgery, development of complications and nature thereof in a group of patients in whom these two illnesses (cholelithiasis and GERD) had been resolved during one single endoscopic procedure. Given the low level of experience in general, our main goal was to conduct an evaluation of surgical results in a group of patients with low surgical risk, according to the criteria issued by the American Society of Anesthesiology (ASA-1 and ASA-2) and younger than 75 years of age. In order to make a correct evaluation, this group was compared with another with similar characteristics, which had only undergone surgery for non-complicated cholelithiasis. Laparoscopic surgery for cholelithiasis was performed in a total of 680 consecutive patients between February 1991 and February 2002. All operations were performed by the same surgeon (FP). The study protocol included: demographic characteristics of the patients, clinical history, physical examination, duration of symptoms, blood biochemistry, electrocardiogram, chest radiography, and abdominal ultrasonography. In cases where patients referred symptoms of GERD, an upper gastrointestinal endoscopy was performed to confirm this diagnosis. If no erosive lesions were present, a 24-hour pH-metry was performed after locating the lower esophageal sphincter (LES) by means of stationary manometry. This test was also made in all patients with esophagitis prior to surgery. Esophageal manometry and pH-metry were repeated 6 months after surgery in all patients operated on for GERD. In addition, intervention details and the post-surgical history were prospectively collected. Operation time was defined as the duration of the procedure from the beginning of the skin incision to the completion of the skin closure. Esophageal manometry was performed with a low-compliance hydro-pneumocapilary perfusion system using a stationary pullthrough technique with a catheter including four orifices 5 cm apart from one another. Twenty-four-hour pH monitoring was made using a Mark III ambulatory recorder (Synectics Medical, Irving, Texas) with a sampling frequency every 4 seconds. This recorder was connected to a monocrystaline antimonium electrode placed 5 cm above the upper part of LES, which was previously determined by manometry, and following a calibration at pH solutions of 1.07 and 7.01. This test was abnormal when the percentage of total acid exposure was over 4% and the DeMeester score was above 14.24 points. In all cases prior to surgery, the presence of a primary motor esophageal disorder (achalasia, diffuse esophageal spasm, symptomatic peristalsis) was ruled out, since its presence may lead to confusion while interpreting the symptoms exhibited by patients. In case of clinical suspicion, or of chemically- and/or ultrasonographically-demonstrated choledocholithiasis, an endoscopic retrograde cholangiography (ERCP) and an endoscopic sphincterotomy (ES) for the removal of stones from the main bile duct were undertaken. Group A (non-complicated cholelithiasis). Included patients with previous clinical episodes of biliary colic and ultrasonographic evidence of biliary lithiasis or microlithiasis. Group B (non-complicated cholelithiasis plus GERD). Patients included in this group were similar to those in group A with associated GERD; they also met the follow-ing criteria: a) patients who presented symptomatic GERD, demonstrated by endoscopy and/or abnormal 24-hour pH monitoring, and whose symptoms (mainly regurgitations) were not adequately controlled with medical treatment (usually with proton bomb inhibitors), or those who had symptoms relieve but compliance was not adequate; and b) patients with complications secondary to persistent GERD, such as esophageal stenosis, Barrett's esophagus, respiratory symptoms, or chronic anemia due to esophageal bleeding. Reasons for exclusion were: choledocholithiasis not resolved endoscopically, suspicion of gallbladder carcinoma, associated condition requiring open surgery, non-treatable coagulation disturbances, age over 75 years, and patients in ASA groups 3 and 4. The presence of choledocholithiasis was not considered a contraindication if this was previously resolved by ERCP. Cholecystectomy was performed in both groups, A and B, using the surgical technique proposed by Dubois (1) with variations depending on the anatomy of the patient and the existence of previous surgery in the supramesocolic space. The same technique was employed in all patients in group B. A retroesophageal suture of the diaphragmatic crura and posterior Toupet's fundoplication was made in order to resolve GERD. This technique has been described by our group in a previous study (14). A prophylactic dose of antibiotics (875 mg amoxycillin plus 125 mg clavulanic acid) was administered to all patients before surgery, and thromboembolic prophylaxis was started preoperatively with low molecular weight heparine, which was administered subcutaneously on a daily basis and maintained for 10 days. In all cases, patients were operated on by the same surgeon (FP), who had previously performed a total of 180 cases of laparoscopic cholecystectomy. Standard statistical methods were used to evaluate various univariate relationships. Group differences were evaluated using the two-sample t test, and the Chi square test when appropriate. All calculated p values were two sided, and p values < 0.05 were considered statistically significant. Out of a total of 680 consecutive patients who underwent surgery, 125 (18.4%) patients aged over 75 years and/or classed as ASA-3 or ASA-4 according to the American Society of Anaesthesiology were excluded. Patients with complicated cholelithiasis were also excluded: 52 (7.6%) with acute cholecystitis, 53 (7.8%) with acute pancreatitis and 4 (0.6%) with acute cholecysto-pancreatitis. Additionally, three patients with achalasia and one with microspherocytosis were excluded. -Group A: three hundred and sixty-two patients (82%) with simple, non-complicated cholelithiasis. -Group B: eighty patients (18%) who had choleli-thiasis and GERD. Conversion of laparoscopic to open cholecystectomy was not necessary in any patients in both groups. Clinical and demographic data for both groups are shown in table I. When compared to patients in group A, group B patients were more frequently males and older than 75 years, weighed more, and more often were hypertensive. 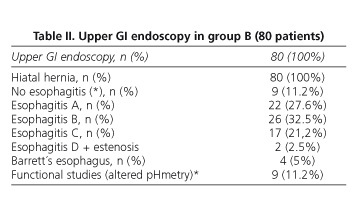 The preoperative endoscopic findings observed in group B are shown in table II. Following the “Los Angeles classification”, we found different grades of esophageal lesions in all patients, except in 9 cases who had normal endoscopy but, abnormal 24-hour pHmetry. These functional studies were repeated in all group B patients after surgery. 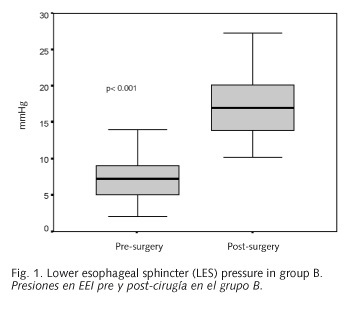 Lower esophageal sphincter (LES) pressures increased from 7.2 ± 2.8 mmHg (range, 2.1-14 mmHg), in the preoperative period, to 17.4 ± 4 mmHg (range, 10.2 - 27.3 mmHg; p < 0.05) after surgery (Fig. 1). Similarly, a normalization of the percentage of exposure to acid in the post-surgical determination [2.5 ± 1.2 (range, 0,1- 4)] and the De Meester score [9.4 ± 5.25 (range, 3.4 - 14.1)] was observed in all patients. From a clinical point of view, a complete resolution of symptoms due to reflux was observed. Only one patient (2%) developed dysphagia for solid food (everyday, but not at all mealtimes) in the late postoperative period (6 months), and a sensation of trapped air persisting at 6 months occurred in two patients (4.1%), causing discomfort (not everyday). These three patients were asymptomatic at 12 months after the surgery. With respect to intraoperative incidences, no significant differences were observed between both groups of patients. 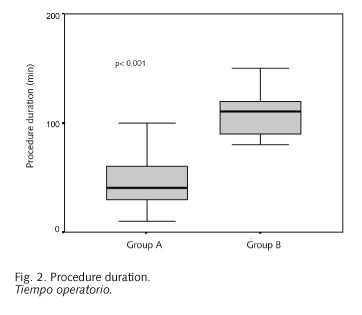 In relation to the rate of complications and the surgical manoeuvres performed, only the duration of surgery reached statistical signification [group A, 48 ± 25 min (range, 10-150 min); group B 112 ± 23 min (range, 80-180 min), p < 0.001] (Table III) (Fig. 2). Likewise, no significant differences were observed in the macroscopic appearance of the gallbladder wall which could cause technical difficulties at the time of surgery and therefore could determine an increase in the complications number of one group or another (Table IV). On the other hand, no differences were observed in the onset of oral tolerance as patients tolerated oral ingestions within the first 24 hours. However, differences were significant in the number of days needed to return to normal daily activities [group A, 5.8 ± 0.89 days (range, 4-10 days); group B, 6.5 ± 1 days (range, 5-10 days), p< 0.001] (Fig. 3). Fig 3. Number of days necessary for returning to normal daily activities. Regarding the hospitalization stay, in group A, 327 patients (90.3%) were discharged within the first 24 hours, 30 patients (8.3%) within 48 hours and 5 patients (1.4%) within 72 hours. In group B, 67 patients (83.8%) were discharged within the first 24 hours, 10 patients (12.5%) within 48 hours, and 3 patients (3.7%) after 72 hours. Hospital stay did not therefore exceed 72 hours, in either group. Postoperative complications were few for both groups: acute pancreatitis occurred in one case (0.3%) and cystic biliary fistula in another patient (0.3%) in group A. Recent studies have shown that an ASA > 2 (15), but not age, is the main factor associated with a greater number of complications in the postoperative period. Age over 80 years, ASA group greater than two, and the presence of choledocholithiasis are all factors associated with a greater conversion rate to open surgery and longer hospital stay in patients with cholecystitis (16). We therefore tried that no differences existed between study groups in this sense. Thus, we attempted to select a group of patients as homogeneous as possible, and only group B included patients that were older and more often obese. In spite of this, these factors did not influence surgery results. In the light of these studies (15,16), it is possible that age is a variable of lesser importance. We speculate that, in our study, if we had used only the ASA classification as the main exclusion criteria for combined surgery, perhaps results would have been similar. The evaluation of the rate of complications in patients with ASA greater than II, or complicated cholecystopathy (cholecystitis, pancreatitis, or both) needs to be further investigated. This leads one to wonder, whether associated surgery should be performed in patients with a high surgical risk, when data exist that surgery for cholecystitis in patients with ASA > II is associated with greater morbidity and mortality (15). Extend the procedure duration is likely not recommendable in these cases. According to our results, we may conclude that performing both procedures within one single surgery may be recommended in all patients with low anesthetic risk where surgery is indicated for both conditions (choleli-thiasis and GERD), with the aim of solving them with no added risks. Furthermore, it is likely that the outcome of the surgery will be more satisfactory, since reflux will disappear after a combined procedure. We do not believe that, at present, this surgery should be indicated to all patients, since those with a high surgical risk (ASA > II) and those who have complicated cholelithiasis may have a greater risk of complications. Such patients include usually older subjects and those where proton-pump inhibitor therapy may adequately control GERD-derived symptoms.